If the words 'extra dark' invoke some kind of secrecy, then let me tell you everything about Lindor extra dark is out in the open. Dark chocolate comes with its own set of benefits. It makes your brain release endorphins - the feel happy hormones, thus improving mood. It also contains a hint of caffeine, which stimulates your brain and enhances memory. Studies also show that it is good for the heart. In addition, dark chocolate has a low glycemic index, thus even diabetics can have an occasional go for it. Further, it is full of anti-oxidants. However, one must remember that chocolate always comes with its share of fats and hence the intake must be in control. 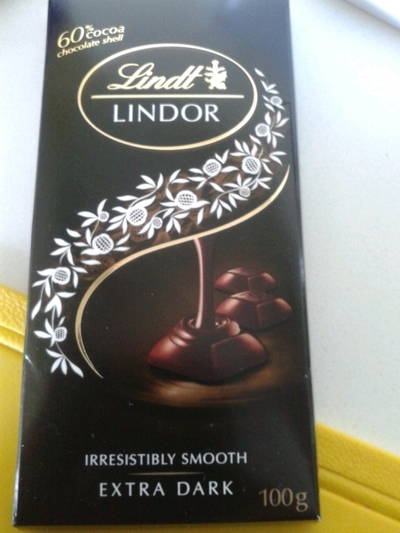 As with any Lindt product, the quality and smoothness of this chocolate is impeccable. It has 60% cocoa outer shell and rich chocolaty liquid filled inside. The packaging comes as individual 18 pieces of chocolate. So no secrets about this extra dark one, only great taste!